We recently bought a large package of organic basil from Trader Joe’s to make the pita pizza that my daughter loves. The problem is you only use a small amount to garnish the pizza, so I had a lot left over. Fortunately for me, my thinking cap was working well and I thought about pesto sauce! It is incredibly easy to make and I didn’t have to make a run to the grocery store for the other ingredients! I served it with organic spaghetti and it was delicious! The wonderful recipe came from the Food Network. 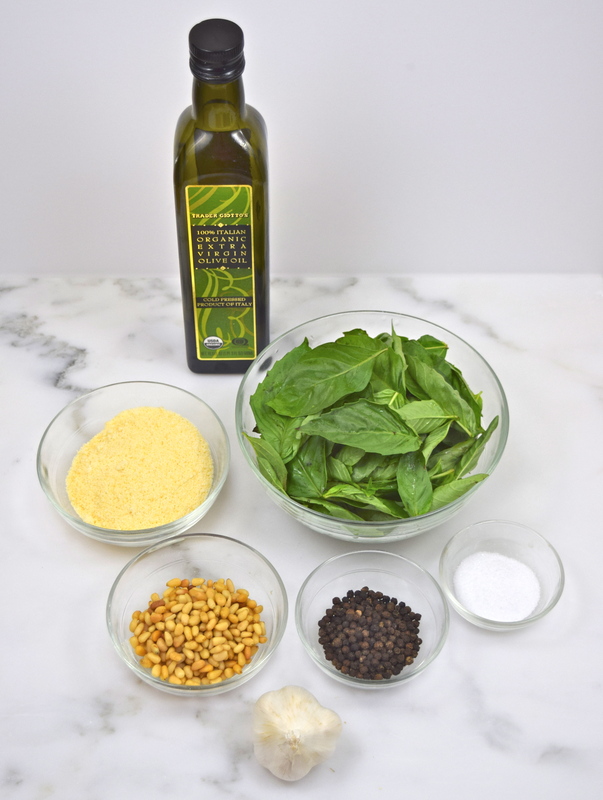 Pulse until coarsely chopped in a blender or food processor, the basil, garlic and pine nuts. Add ½ cup olive oil and blend until smooth. Add salt and pepper to taste, but go easy on the salt, because the Parmesan is salty. If you are going to use the sauce immediately, add the Parmesan cheese and the remaining olive oil. If you want to freeze the sauce, transfer it into an air-tight container and drizzle the remaining oil on top. Can be left in freezer up to 3 months. When you are ready to use it, thaw and stir in cheese. Makes approximately one cup of sauce. Very good! thanks for bringing it to FF49! What a great way to use the left over basil! I frequently run into a similar problem with cilantro. I end up buying a whole bunch and only need a little bit. Fortunately, I love cilantro, so I can make a lot of cilantro dishes in a short period of time. 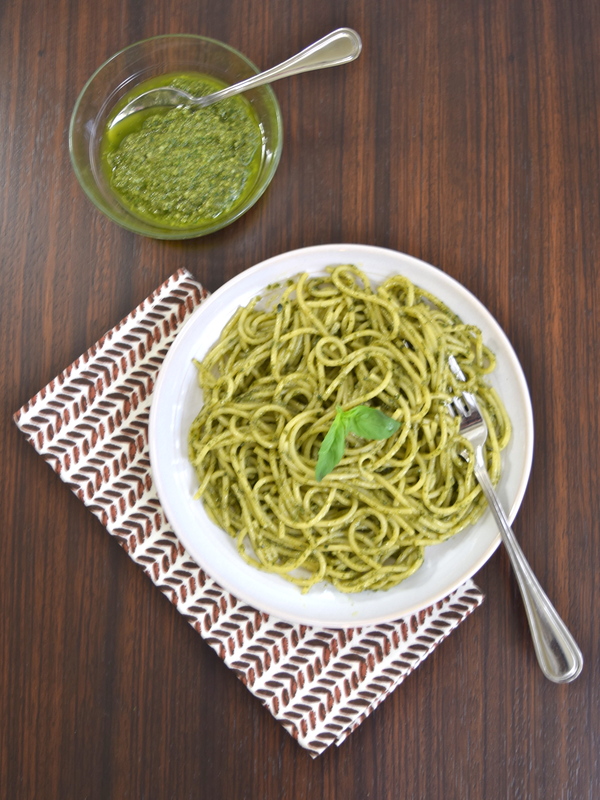 I’m especially impressed that you came up with this pesto sauce without having to run to the grocery store again. Thank you so much for bringing the pesto sauce to Fiesta Friday; I’m sure it will be a hit. And, happy 2015! Thank you so much for taking the time to comment! I really appreciate it! Happy New Year to you too! Thanks, Bonnie, but I got myself a beginner’s DSLR camera (Nikon d3300)and some lighting equipment for Christmas. I couldn’t stand being rejected by a certain food website anymore! There is so much to learn…:). I got the book too! Now, I know why your pictures are fabulous! You took the class from a master photographer! I don’t feel so bad now. 🙂 Just need more time in the day! Thank you! and wanted to mention that I have truly loved browsing your blog posts. Kathlene, thank you so much for your kind comment and for following!